There were fifteen children in the Dalton family, and only 4 of them were bad. Their father Lewis Dalton was a saloon keeper who disliked hard work. Their mother, Adeline, was a distant relative of the outlaw Younger family. She believed that the Youngers were a disgrace and Adeline tried as hard as she could to instill religious values in her children because she did not want her children to go bad. In 1882, the Dalton’s raced horses in Oklahoma Indian Territory. There the brothers' reputation as fighters spread. Before long, Frank, Bob, and Grat Dalton went to work as policemen on the Cherokee Reservation. Not long afterward, Frank, who was very honest, became a United States deputy marshal. His primary responsibility was to deliver prisoners for which he received 2 cents a mile and 2 dollars a prisoner. It was very dangerous work and he was killed by bootleggers. Grat and Bob were not very honest and they were soon accused of shaking down travelers and stealing horses and were forced to resign. Next, Emmett, Bill, Grat, and Bob Dalton held up gambling establishments, and then ventured into train robbing. Before long they were indicted for robbing the Southern Pacific Railroad. The indictment forced the Dalton’s to go into hiding because several posses were looking for them. They next robbed the MK&T Railroad which was loaded with cotton money that was destined for Texas banks. This haul got them almost $11,000. Just a short time later, on the night of June 1, 1892, the Daltons waited in the town of Red Rock to rob another train. Only this time they sensed something was wrong so they let the train pass. Then just as they thought that they had blown the opportunity for a big score the railroad tracks again began to vibrate. The first train had been a set up. It was a heavily armed decoy train. 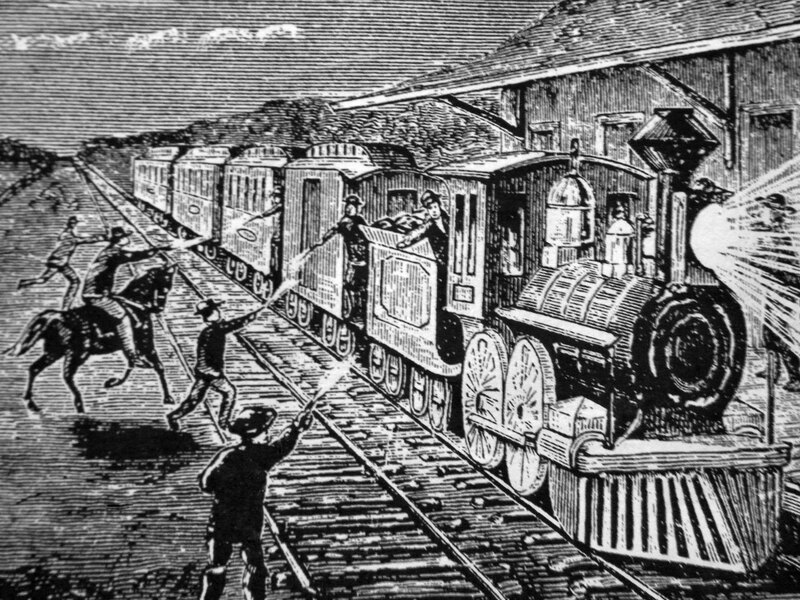 The Dalton’s robbed the second train with dynamite forcing the railroad employees to give them all of the money. Soon after, hundreds of law men began searching for the Dalton brothers. The next few train robberies resulted in very little profit so the Dalton’s turned to bank robberies. They decided to rob two banks in Coffeyville, Kansas at the same time. However, Coffeyville had been warned by a well known lawman named Chris Madden that the Dalton's would soon strike and he had prepared the town. No one noticed the Dalton's until they reached the public square. As soon as they were spotted the hardware stores began passing out all of their guns, including rifles and shotguns. Bob and Emmett went straight into the First National Bank. They first tried to go out the front door, but were met with heavy gunfire. So they raced out the back door with $21,000, shooting everyone that got in their way. Then when they were about to get away they realized that their brother Grat was nowhere to be found. When they returned to town they found Grat exchanging gunfire with the local citizens. Grat only had about $4,000 in heavy silver coins and $1,000 cash. Soon afterward Grat killed the town marshal and he himself was struck twice with gunfire. Grat was now blind and shooting in all directions when a merchant finished him off. At this time only Emmett had a chance to escape, but instead he turned his horse around and rode into blazing gunfire in an attempt to save his wounded brother Bob, but Bob was too weak to take his hand. In the end 4 bandits, and 4 citizens were killed and many more were wounded. Emmett would survive. The bodies were left in the street for hours so that photographs could be taken of the dead. All but $22 was recovered.